Buy 1 for $20.25Buy 2 / Save $1.08!Buy 3 / Save $4.05! 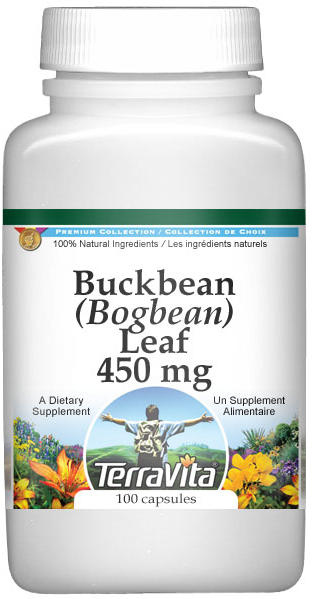 Buckbean, or Bogbean, leaves can be used to help support loss of appetite and dyspeptic complaints. It is also employed as an ingredient in cholagogues, geriatric supplements and especially in anti-inflammatory and antirheumatic formulations. Traditionally, it can be used to help support skin disorders, cold and fever. Industrially it is a hop substitute and an ingredient of bitter liqueurs. Other Names: Bog bean; trèfle d'eau (French); Bitterklee, Fieberklee (German); trifoglio d'acqua (Italian) trébol acuático (Spanish). Description: Bogbean is a leafy, water-loving plant that grows in marshes and on lake margins. It has large, trifoliate, basally sheathing leaves resembling the leaves of beans (hence the common name bogbean) and attractive white and pink flowers with distinctive fringed petals. Menyanthes is chemically similar to members of the Gentianaceae. Origin: Northern temperate zone (North America, Europe and Asia). The plant is not cultivated but is wild-harvested in midsummer. Parts Used: Dried leaves (Menyanthidis folium; synon. Trifolii fibrini folium). Therapeutic Category: Bitter tonic (amarum). Preparation and Dosage: Unsweetened tea, made from 0.5 - 1 g of finely chopped leaves is taken half an hour before meals. The daily dose is 1.5 - 3 g.
Active Ingredients: The leaves contain bitter-tasting secoiridoid glycosides, including dehydro-menthiafolin (main component), menthiafolin and loganin, and coumarins (scopoletin, scoparone, braylin). Also present are phenolic acids, tannins, flavonoids (kaempherol, quercetin, O-methylquercetin and their glycosides), a volatile oil (benzaldehyde, citronellol), triterpenes and traces of alkaloids (gentianine, gentianidine). Health Effects: Bogbean is closely related to gentian and other members of the Gentianacea (see Gentiana lutea and Centaurium erythraea) and it is similarly used as a bitter tonic. The varied herbal uses have not yet been thoroughly investigated from a scientific point of view. Scopoletin and scoparone are known to act as cholagogues and choleretics and have antihepatotoxic activity. Scopoletin is stated to have spasmolytic effect. Extracts show antimicrobial properties (probably due to the activity of iridoids, tannins and terpenoids). The rhizome and the leaves of Buckbean or Marsh Trefoil contain a bitter principle, they are used as atonic and digestive. In a mixture with a little mint, Buckbean is regarded as a sedative for the nervous system.